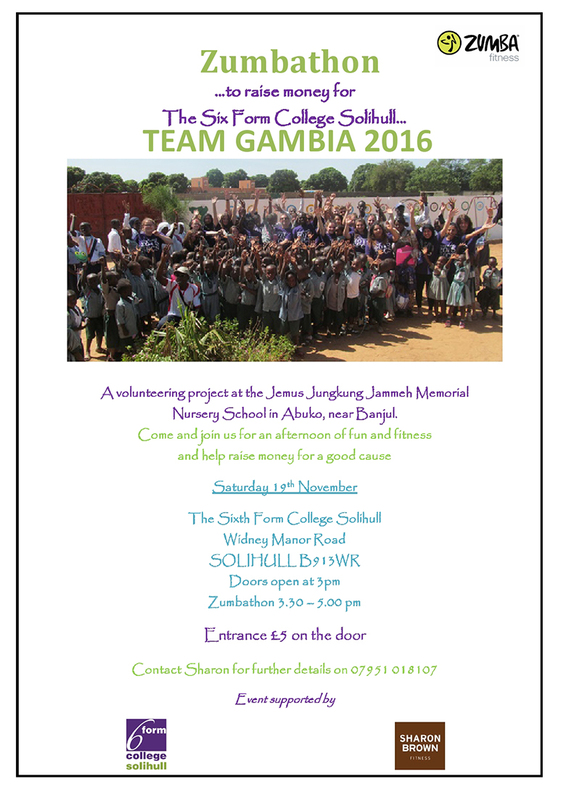 The Sixth Form College, Solihull runs a volunteer project called Team Gambia and one students who is part of the project this year is raising money for this worthy cause by organising a Zumbathon! Taking place on Saturday 19 November from 3.30pm – 5.00pm in the College’s Claire Hicks Sports Centre, this event costs £5 to be a part of. All money raised will go to an impoverished school in the Gambia, which students will be visiting later this month. This school is the Jemus Jungkung Jammeh Memorial Nursery School in Abuko, near Banjul. The school was built thanks to the hard work and fundraising of Hamstead Hall School in Handsworth Wood. Peter Evans at Hamstead Hall School started the project about eight years ago and The Sixth Form College, Solihull joined the project in 2013 for the first time. It is now an annual venture for the College, to support the outstanding work that Peter Evans has started. Every student embarking on this trip is set a challenge to raise £400 each. With it costing just £375 to pay a teacher there for one year, this fundraising target will do real good for the school in The Gambia. There is currently a large waiting list of children who want to attend the school, but they do not have room for them, despite class sizes of 50-60 children in a class. The money we raise will help fund the construction of two new classrooms to fill that demand. Staff and students will work together over the 9-10 months leading up to the trip itself to raise as much money as we can for the school. Anyone who wishes to donate funds or materials (such as teaching materials, children’s clothing or raffle prizes for fundraising events), please call 0121 704 2581.